By Elizabeth Sunshine, posted September 19, 2016 at: http://www.breakpoint.org. Sunshine is an MTS student at the University of Notre Dame with a focus in Biblical Studies. Have you ever wondered if you’d be happier if only you didn’t care about things so much? I have. Last year I led discussion groups as a teaching assistant. I felt horribly anxious before class and often felt disappointed in my performance afterward. I also had a hard time giving constructive criticism. The source of all these problems was my desperate desire to be liked. I wanted the students to think I was a great teacher, which, ironically, probably made me a worse teacher than I would have been otherwise. My experience would seem to demonstrate the Buddhist claim that non-attachment is the way to avoid suffering. If I were less attached to my students’ opinions, I would not have suffered that anxiety. Buddhism is a remarkably consistent, well-thought-out worldview designed to tackle one of the hardest problems human beings face: the problem of suffering. For that very reason, it sheds light on the Christian faith, from which it differs not only in its explanation of how the world works, but also in its even more fundamental conviction that suffering is always to be avoided. The problem of evil is usually posed as an objection to belief in God, but actually, it’s a problem that every belief system needs to address. Terrible things happen in the world, so any account of how the world works needs to explain evil and suffering. Buddhists see suffering as the central feature of the world. Everything, they say, is unsatisfactory, if for no other reason than that it is impermanent. Nothing gives permanent happiness because nothing lasts permanently. Our problem, says Buddhism, is that we have desires for unsatisfactory things, desires that are doomed to be frustrated. It is these desires that keep us trapped in the cycle of reincarnation, being born again and again in different bodies, all of which are doomed to suffer and die. The only way to escape from suffering, then, is to let go of desires through practices such as meditation. 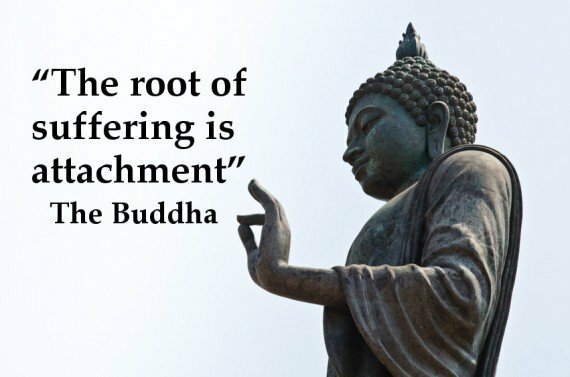 Buddhists are told to pursue non-attachment, a state without desire, which leads to enlightenment and an end to suffering. My teaching experience was an example of attachment leading to suffering. Here is another. I lived in Taiwan for three years, making many close friends. Now that I’ve moved back to the U.S., I miss those friends horribly. But I also love the people I’ve met here and would hate to leave my new community. I’ve realized that I need to choose a career where I won’t have to move frequently because every time I do, it breaks my heart. Now, a Buddhist might claim that my problem is attachment to these people. If I didn’t have such a strong emotional connection to them, leaving wouldn’t hurt so much. That’s not to say I shouldn’t be kind; Buddhism instructs its practitioners to have compassion for all living things. But Buddhist compassion is a sense of general benevolence, wishing well to all beings, rather than love for particular individuals. This compassion may flow out into acts of kindness to individuals, but the concern should be spread among all beings equally. This is where Christianity and Buddhism diverge. Christianity is particular. We believe that God revealed Himself first to a specific nation (Israel) descended from a specific person (Abraham), in specific places (Mt. Sinai, among others). He then took the next step and became human, a specific man named Jesus raised in Nazareth during the first century A.D. He healed specific individuals who asked him for help, entrusted His most detailed teaching to 12 people, and died as atonement for sin— which means the specific morally wrong actions of individuals. You could say that all this attachment to particular individuals was God’s big mistake. From all eternity, God existed in a state much like enlightenment, free from suffering and without attachments. The members of the Trinity were bound only to each other through love, a love which could never disappoint because those involved are eternal, unchangeable, and perfectly good. But then God created a finite, temporal world and put finite, temporal humans in charge of it. Not only that, but He became emotionally attached to the world, calling it good and telling the humans to fill and care for it. He loved these humans deeply, but they chose not to love God back. Human actions have been in Buddhist terminology “unsatisfactory,” to say the least. Before long humanity became so evil that “God was sorry that he made man, and it grieved him to his heart” (Gen 6:6). To make a long story short, God eventually decided to solve the problem of human sin through . . . more attachments. These attachments were called covenants, solemn promises confirming relationships between God and humans. Again and again God committed Himself to bless individuals and, eventually a whole nation, Israel. But Israel repeatedly failed to follow God. Many prophets describe God’s relationship to Israel as frustrating and even painful for Him. Hosea compares God to a husband betrayed by his wife. Jeremiah describes God as lamenting the destruction of Jerusalem, brought on by Israel’s sin. Theologians tend to balk at the idea that God can experience pain, and certainly comparisons between God and humans work only by analogy. But the deeply emotional language used of God is getting at something real. Metaphors only work when there is an actual similarity, and if humans are made in the image of God, our emotions must parallel something in God’s being. So God experiences suffering because of His attachment to Israel. Whereas in Buddhism attachment leads to reincarnation, in Christianity, that attachment leads to a unique form of incarnation. God goes through a human life with all its weaknesses and frustrations and ultimately ends up suffering horribly and dying. If only he’d listened to the Buddha and avoided attachment all that pain could have been avoided! But God knew exactly what He was doing. From the moment of creation, God knew that humanity would sin, that Israel would frustrate him, and that He would become human and die for us. None of this was a surprise. God could have avoided it all, but chose not to. And this gives us another way to think about suffering as well. If God didn’t do everything in His power to avoid suffering, maybe we shouldn’t either. Maybe pain can be redemptive. That’s not to say suffering is good. Evil is still evil. It just means that sometimes, evil backfires on itself, and God brings good about anyway. We shouldn’t seek out suffering. But most of us don’t need to. Buddhists are right that suffering is inevitable, and it is perfectly reasonable for them to hope for an end to suffering. Christianity also promises an end to suffering when Christ returns and wipes every tear from our eyes. But unlike Buddhism, Christianity also promises an end of suffering in the sense of a purpose or a goal. Suffering is a tool in God’s hands that He uses to make us more like Christ and to undo the effects of sin. Love can lead to suffering, but it also leads through suffering to a greater purpose. It brings good out of evil. Hosea 11:8 — (God said), “How can I give you up… How can I hand you over, Israel?… My heart is changed within me; all my compassion is aroused. John 11:35 — Jesus wept. Romans 5:8 — But God demonstrates his own love for us in this: While we were still sinners, Christ died for us. O give thanks unto the Lord, for He is good; His steadfast love endures forever. Amen.